The New Orleans Pelicans personnel challenge just got steeper as the team announced a new addition to the long-term injury list: starting center Jason Smith. A recent MRI revealed Smith has suffered cartilage damage in his right knee and will now be out indefinitely. "He wanted to play so badly this year. 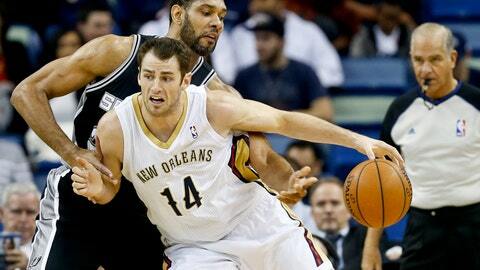 It’s a contract year for him, so there are at lot of things at stake," Coach Monty Williams said. "It’s tough when your body fails you. We’ve got to go about doing our jobs. It just got tougher, but we have to keep going." The team training staff can’t identify exactly when Smith injured his knee, but Williams believes it’s a hurdle Smith has been fighting through, after watching injuries decimate this team as of late. "Personally I think it happened awhile ago, and he’s tried to play through it," Williams said. "He felt some different things, more pain the past few days. We checked it out and found the damage. But we can’t pin point when it happened." Smith joins a list of injured Pelicans stars that includes forward Ryan Anderson and point guard Jrue Holiday, leaving New Orleans incredibly short-handed on the court. "It’s tough because you need a good shooter like Jason," shooting guard Eric Gordon said. "You don’t see too many 5 men who can shoot like him, especially that mid-range shot." Smith’s influence in the locker room is also undeniable. He’s the most tenured veteran on the team, a voice every other player respect and heed. Saturday versus the visiting Golden State Warriors, Greg Stiemsma will take the job of starting center, but Williams says he may also rotate Alexis Ajinca into that role in the future. The Pelicans will undoubtedly be forced to add to their roster now, since there is no timetable for when Smith, Anderson and Holiday will return.